In the farm-to-table sequence, the next big step is getting food beyond home and restaurant kitchens and into large institutions. Few people dispute the value of eating more locally produced food. It’s generally fresher and healthier, it keeps money in the local economy, and it promotes a sense of community. That being said, there is very little local food available through most of our region’s biggest food providers: institutions like schools, hospitals and corporate cafeterias. For local food producers, selling food to institutions is a final frontier. Finding a way to break into food procurement systems governed by corporate contracts and global supply chains is daunting. But a few local food champions are realizing the value of opening up this market to local farms. 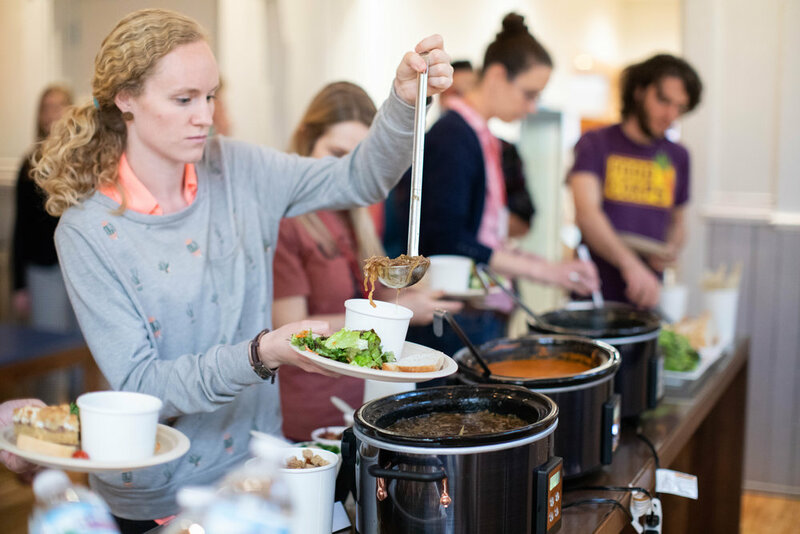 In June, Green Umbrella named two institutions “Local Food Purchasing Heroes” for their efforts to bring local foods into their systems at the Midwest Regional Sustainability Summit. The first is Dayton Independent School District, a small district of about 1,000 students in Northern Kentucky, which became the first district in the region to start purchasing local produce in the 2017–2018 school year. Stacie Pabst, the district’s new food service director, says some of the groundwork had been laid before she started last year, but when there was an opening in the spring to bring in a new vendor, she jumped at the chance to source locally. “I was completely on board with local food because I am a dietitian and I believe in the nutritional quality, and I believe that it’s important to instill those beliefs in our kids now,” Pabst says. Pabst worked with the Ohio Valley Food Hub Project—a partnership between our region’s two local food hubs, Our Harvest Cooperative and Ohio Valley Food Connection—to bring in local lettuce, microgreens, and apples the size of softballs starting in March. The kids were even treated to chervil and daffodil flowers on the salad bar. For the district’s summer program, Pabst served produce like cantaloupe, potatoes, peppers, and cucumbers, and she was able to offer fresh blueberries instead of frozen for parfaits. “They’re selling like hotcakes,” according to Pabst, who says the kids prefer to eat whole produce over the canned stuff. Not only are the students getting wholesome, local food, they’re more engaged in what’s going on in the lunchroom. Pabst has also been able to take advantage of the Kentucky Vegetable Incentive Program, a pilot program that reimburses the district up to 20% of food costs that are purchased from local Kentucky farms. For the coming school year, the food hub is now her main supplier of produce; she has a secondary supplier to order from when things are out of season. The second Local Food Purchasing Hero award went to Spectra Food Services & Hospitality Management, the food service provider for the Duke Energy Convention Center, for work they did when the National Farm to Cafeteria Conference came to Cincinnati for three days in April. 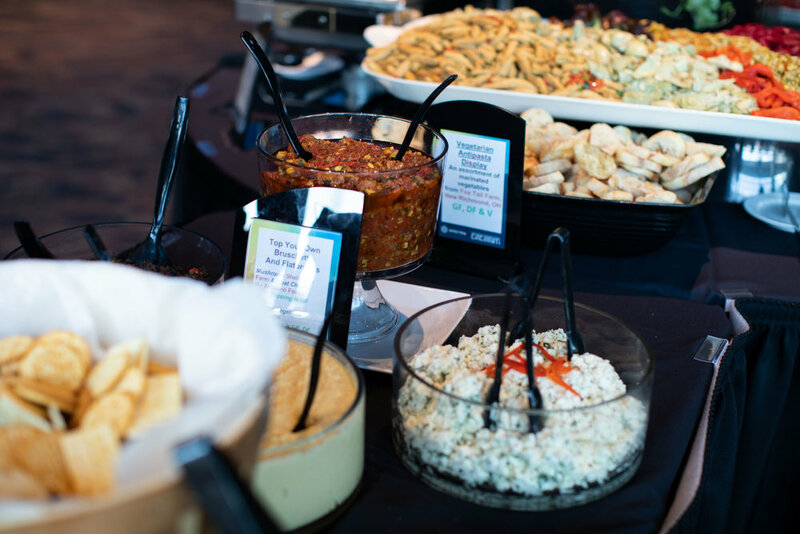 The conference planners wanted to feed the 1,000 attendees with local food as much as possible, a natural request for an organization that advocates for getting more local food in schools nationwide. Spectra was familiar with procuring food from local farms, but it had only done so for small dinners, never for an entire conference. The fact that the conference was in April, when local food availability is at a low point, added to the challenge. Steve Hennigan, director of catering sales for Duke, said none of Spectra’s contracted distributors carried any local products, so he had to get approval to go outside their established avenues. Institutional buying means big business: In Iowa, research shows that if 25% of institutions bought local food, it would support 4,249 farms, 12,320 full-time farm jobs, and generate $800 million. He had to reverse they way they plan food for events. Usually, a conference customer chooses menus months in advance. In this case, the ingredients that were available at the time determined the menus. Hennigan worked with Alice Chalmers, founder of Ohio Valley Food Connection, who helped him source 65% of the conference’s food from more than 20 regional farms. Those items included eggs, root vegetables, salad greens, milk, cheese, beef and chicken, and breakfast sausage made by Avril Bleh Meat Market from local hogs. The desserts were made from local sweet potatoes and apples. Hennigan says local food hasn’t translated to food service and convention centers because getting the supplies in large quantities on demand is harder to do. It’s much easier to buy from a huge distributor where anything is available, in any season, from anywhere. Plus, his customers are used to choosing from a set menu rather than letting the caterer work with what happens to be in season at the time. But with the success of the National Farm to School Conference, Hennigan says Spectra is planning to offer locally sourced menu options to customers in the future. “We did this, so we can make anything work,” he says. Chalmers also points out that it doesn’t have to be all or nothing for an institution. “It could be just 5% of your total food budget, and you'll have a huge impact for the farms that you're sourcing from,” she says. Research from Union of Concerned Scientists backs this up. They found that if 25% of the more than 22,000 institutions and intermediate markets in the state of Iowa switched to buying local food, it would generate over $800 million annually for the state’s economy. If at least half of those purchases came from midsize farms, it would support over 4,249 farms and 12,320 full-time farm jobs. For Pabst and Hennigan, local food hubs were key to making these changes possible. Otherwise, they would have to research, contact, negotiate, and coordinate with individual farmers to source individual ingredients on their menus. That’s why Green Umbrella decided to showcase what’s possible with these awards. “We wanted to draw attention to the fact that large institutional purchasers can purchase local food through our region's food hubs, who aggregate orders from farmers, making the process much simpler for the customer,” says Ryan Mooney-Bullock, executive director of Green Umbrella. Amy is a freelance writer and content strategist with an interest in sustainability, food, and wellness. After 12 years of apartment living in Brooklyn, NY, she's enjoying having space to learn how to grow food in a community garden plot here in Cincinnati. She blogs regularly about sustainability for the nonprofit Sustainable America.